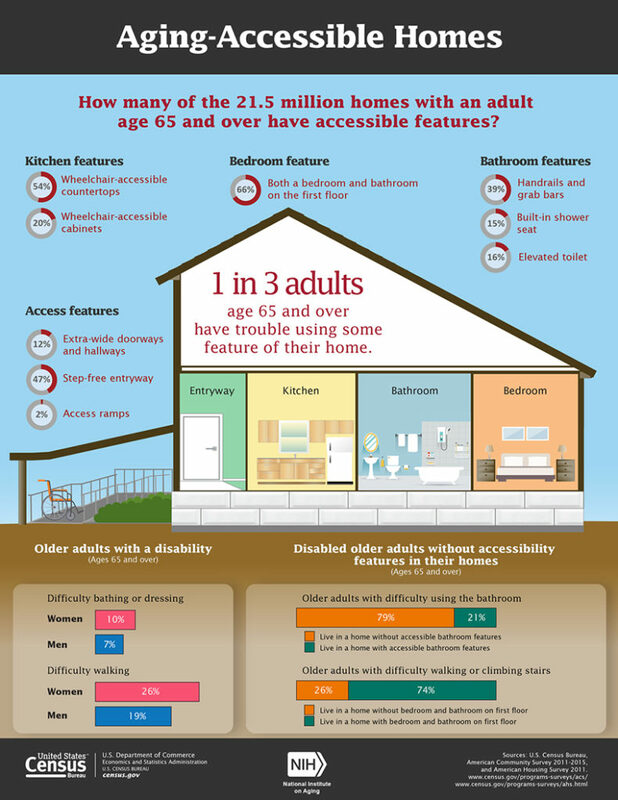 An infographic on why aging in place home modifications make so much sense for older adults and what areas of the home to focus on for residential accessibility. Aging in place home modifications are getting a lot of media coverage as of late. This is due to home modifications being an integral part of the whole aging in place experience. When you think about it, as we grow older, who really wants to have to move to someplace new? Most of us don’t. Or, at least, we want to be able to choose where that is based on what we want. The truth is, almost every home in the United States was not built to be accessible. By that, I mean not accessible for anyone, really. But, certainly not for us when we’re older and our abilities have changed. I want to make sure people understand what having an accessible home means and why it is important. That is one of the reasons why I’m sharing this infographic from the United States Census Bureau and The National Institute on Aging. Not only does it cover some key statistics around accessibility, it also clearly shows several aging in place home modifications you should make at home for later life. I would be happy to talk with you about aging in place home modifications and how you can begin remodeling your home for later life. I’m Kathy Subasic, an Occupational Therapist and Certified Aging in Place Specialist. I provide aging in place home accessibility in Baltimore, MD, York, PA and surrounding areas.